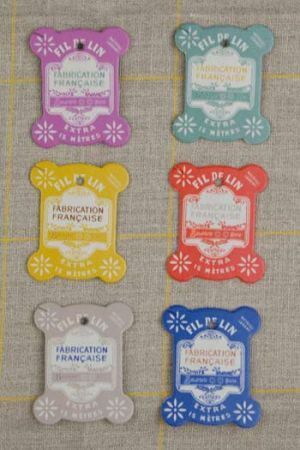 These thread cards from France bear names of towns in Normandy, as a tribute to the history of this linen-producing region which was filled with linen mills in days gone by. 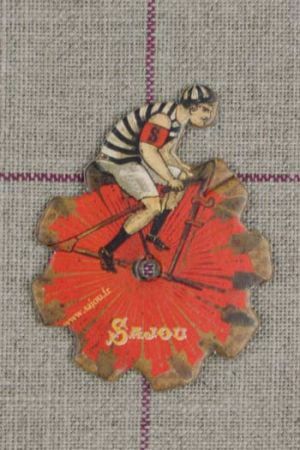 In the past, linen thread was mainly sold on this type of cards. 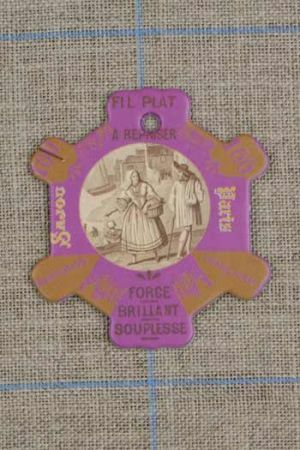 The cards are of excellent quality, retracing the principals of cards of old, to make organising your threads a real pleasure. 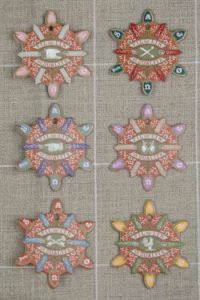 They are sold in series of six, printed on both sides on 2mm thick cardboard. 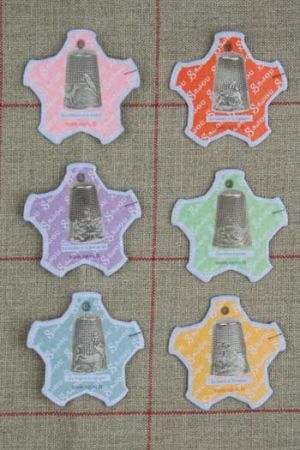 Pattern widths are all approximately 6 cm. All winder sets are shown below. Six winders in each set. Some detailed pictures of individual winders at bottom of page. These cards depict six women's portraits in an Art Nouveau style (19th century). 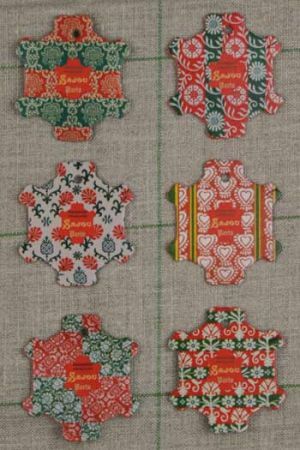 These thread cards depict six red and green motifs inspired by vintage wallpapers. 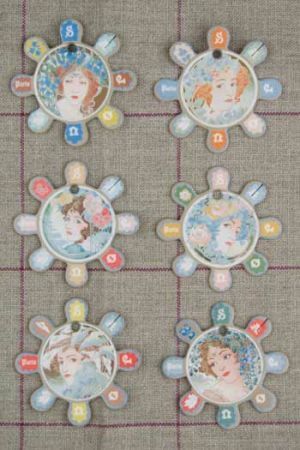 These thread cards depict tiny floral motifs, inspired by vintage wallpapers. 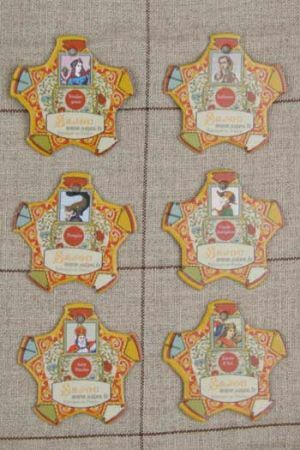 These cards feature the heads of different characters : a fireman, Joan of Arc, Saint Nicolas, an indian girl, a grape picker and a ranger. 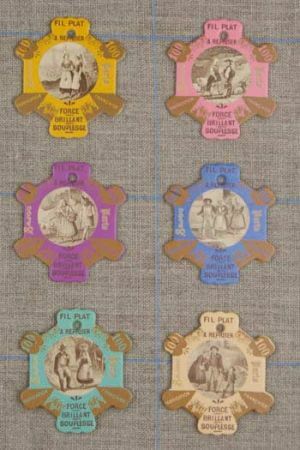 These thread cards are reproductions of the famous silver thimbles evoking Jean de la Fontaines' fables: The Crow and the Fox, the Hare and the Tortoise, The Wolf and the Stork, The Fox and the Stork, The Two Pigeons, The Milkmaid and the Urn. 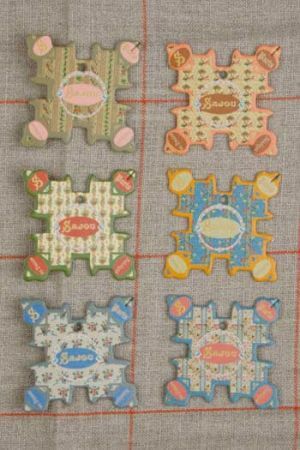 These thread cards are printed in the style of vintage cards, the centre depicting everyday objects. 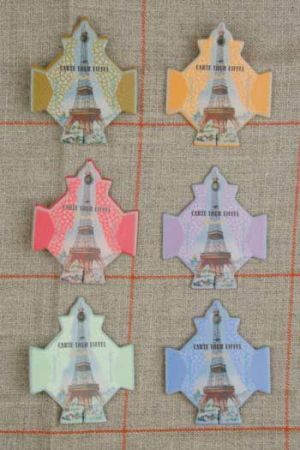 These thread cards depict the French icon, the beloved Eiffel Tower, in six colours: orange, red, mauve, blue, pale green and khaki. 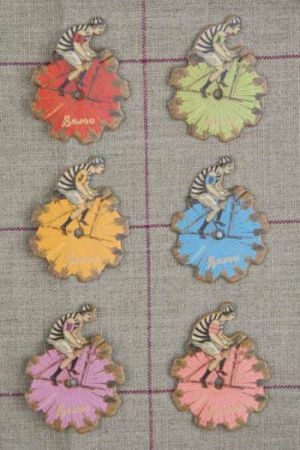 These thread cards depict six different colours old fashioned racing cyclist. Their armband are "S", "A", "J", "O", "U", the last one is "Paris". 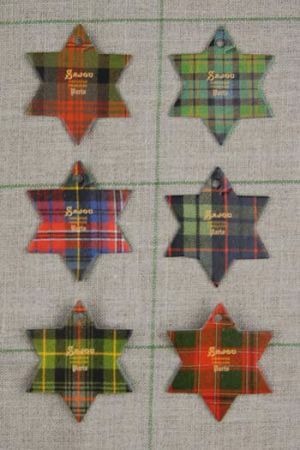 This thread cards depict six traditional tartan motifs. 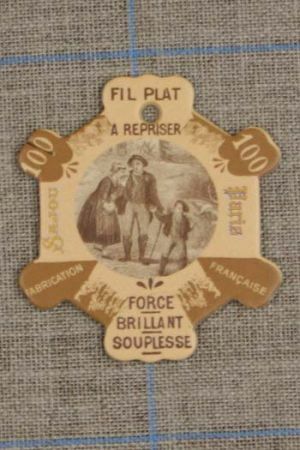 These thread cards are illustratied with a series of engravings in sepia tones, representing characters in regional costumes carrying out different jobs. 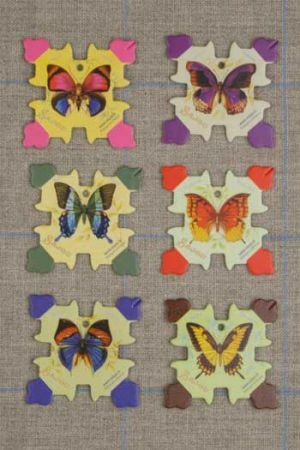 This thread card series features butterflies: Terinos Clarissa, Pyrrhanea Troglodyta, Agrias Claudia, Papilio Blumei, Papilio Lycrophon et Kallima Paralekta. 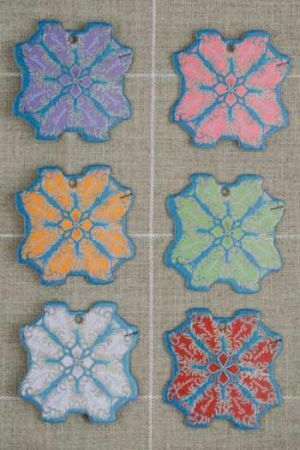 In this series of thread cards, a feather motif dating from the 19th century is depicted in six colours: red, sky blue, green, orange, pink and mauve. 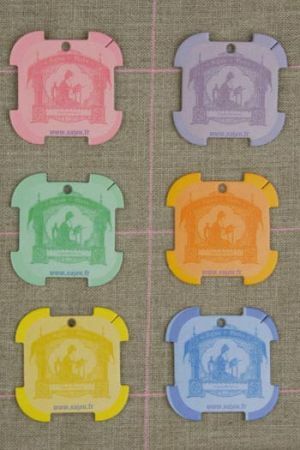 In this thread cards series, the embroiderer, one of Sajous' historical symbols, is featured in blue, rose, pale green, yellow, orange and mauve. 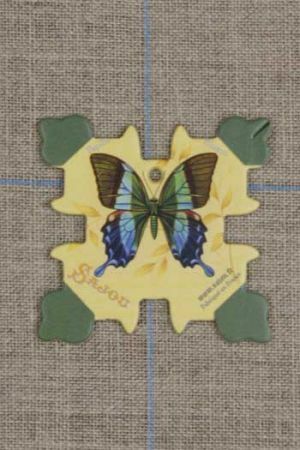 These thread cards are a re-edition of a vintage model which was often found in haberdashererss: a great classic in thread card designs. Below - enlarged photos of four of the winders.